Universal hoses from ELAFLEX according to EN 12115, mainly used for IBCs and barrels, containers, rail tankers, tankers and fixed installations. We deliver sizes DN 13 - 100, with and without helix. Distribution usually by authorized distributors, agents and subsidiaries. OEMs are supplied directly by ELAFLEX. 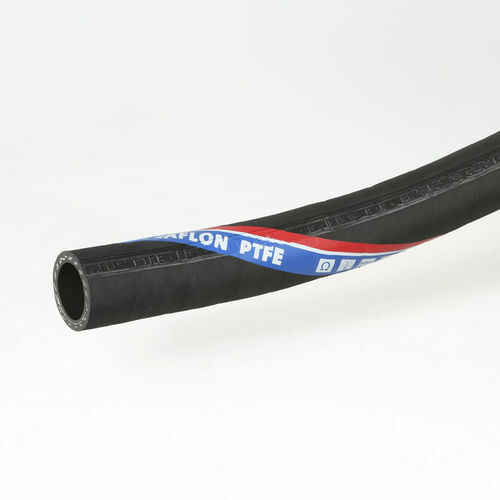 The new star among our EN 12115 'Ω / T' hoses: Electrically conductive, seamless lining of Teflon® PTFE, for all commonly used media up to +150 °C ( depending on medium ). Conforms to FDA and USP Class VI.